Will two key SF ballot measures on housing win? Will SF’s Mission Moratorium and Short-Term Rental Initiatives Win? San Francisco’s November 2015 ballot has gotten a lot more interesting. After backers of an initiative to more strictly regulate short-term rentals announced plans to go to the November ballot, Supervisor David Campos stated he would move forward with a long talked about initiative imposing a market rate housing moratorium in the Mission. Assuming both measures qualify, can they win? Here’s our preliminary assessment. The proposed 18-month moratorium on market rate housing in the Mission meets the key prerequisite for successful initiatives: it is simple and can be explained in one sentence. In The Activist’s Handbook, I examined California and local ballot measures and found that a lack of simplicity almost always brings defeat; that is not a problem with the moratorium. To the contrary, like the successful campaign for “No Wall on the Waterfront,” voters will know exactly what they are voting on when they see the moratorium on the ballot. Another predictor of success is whether a measure appeals to the self-interest of a significant portion of the electorate. Initiatives lacking broad self-interest appeal are vulnerable to well-funded opposition campaigns, since voters lacking a self-interest are more easily persuaded to vote no. The self-interest of San Francisco voters toward a Mission market rate housing measure can break in three ways. First, many voters support new housing construction and will oppose the measure. Second, many voters don’t want housing built anywhere in the city, and they will strongly back the moratorium. 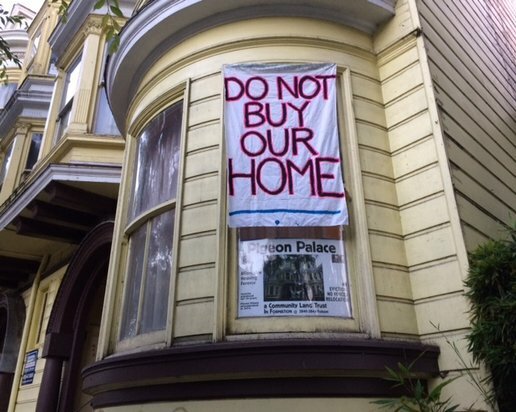 Third, we have voters who feel that if housing is to be built, they prefer it be in the Mission than their neighborhood—which would lead this group to vote no. For example, the Richmond, Sunset and other Westside neighborhoods vote for pro-development supervisors while opposing housing developments in their own backyards. These voters may strongly oppose the moratorium for fear it could build development pressures in their neighborhoods; or their more laissez-faire political outlook could see the initiative as an unfair restriction on private property. But before we assume the Westside goes big against the moratorium, consider that many conservative voters are unhappy about San Francisco’s dramatic and rapid changes in recent years. They may see the moratorium as a chance to say Basta! (Enough!). Will the campaign for the affordable housing bond in November hurt the moratorium measure? It could. Some voters will feel that the bond is addressing affordable housing so that market rate projects in the Mission are fine. Others will feel that the bond is dealing with production needs, so that an 18 month moratorium won’t cause harm. As I wrote about the Peskin-Christensen D3 supervisor’s race, voter turnout could decide the moratorium’s fate. November turnout is projected to be low. The mayor’s race will either be uncontested or not seriously contested. Mayoral races typically drive voter turnout in this election cycle, because they include citywide get out the vote operations that initiative drives cannot match. The moratorium should drive up turnout in the Mission and among progressives. But the overall turnout will be more moderate than in even numbered years. The great irony is that if, as Supervisor Campos argues, the future of the Mission is at stake, it will be decided by Westside voters and others living far from the Mission neighborhood. The measure is not simple. To the contrary, it is a complex law that cannot be described in a single sentence. Complex measures can win. Those identified with the initiative—Dale Carlson, Doug Engmann and Calvin Welch—spearheaded the winning Prop M anti-highrise measure in 1986 that was also multi-pronged. I wrote the lengthy Prop G on the November 1994 ballot that created the Department of Building Inspection, and it too prevailed (though its unavoidable complexity reduced its victory margin). But Prop M could be described in one sentence as “limiting downtown development. And Prop G was a one sentence attack on an existing city agency’s poor performance. In contrast, short-term rentals are popular in San Francisco. A simple “anti-Airbnb” message will fail. I can already see the No side’s campaign literature. It will tell the story of a single woman with kids who rents out rooms in their apartment to keep a roof over their family’s head. Voters will hear from people with AIDS, seniors, working people holding two jobs, and others for whom short-term rental income has been a lifesaver. We know these stories because they have been told by real people at public hearings on short-term rental legislation. Initiative proponents will have a hard time coming up with enough short-term rental horror stories to combat opponent’s accounts. The No campaign literature will include a fold out that enables voters to see all of the measure’s provisions. Red arrows and text will highlight phrases and raise alarming concerns. Multi-provisioned initiatives are easier to defeat because opponents only have to get voters to oppose one part to justify a no vote. I describe in The Activist’s Handbook how opponents of a school voucher measure on California’s 1993 ballot zeroed in on a small provision that allowed public financing for schools operated by religious sects. Suddenly, the initiative was now about giving tax dollars to witches to operate schools. Voters who otherwise may have backed vouchers did not want money going to witches, and the measure was defeated. The short-term rental measure also faces the problem of greater voter intensity among opponents. Short-term rental hosts have a powerful financial interest in renting out units, while those unhappy about their neighbor’s unit being rented to tourists are unlikely to be motivated enough to walk precincts on weekends. We are months away from the election and all kinds of things can happen to change the short-term rental dynamics. For example, on May 6 our great City Attorney Dennis Herrera (and we should all take a moment to appreciate yet another major victory in his remarkable career) won $276,000 in fees and penalties against landlords illegally renting to short-term tourists. If current law is unenforceable, how did Herrera enforce it? And I know that once nonprofit standing is enacted by the Board (and it has majority support and that of the mayor), we’ll read about more successful enforcement actions. Of course, all this assumes both campaigns gather sufficient signatures to qualify for the ballot. Time is running short, so expect to soon see petitions on the street for both measures.